Defence (or Defense, as it is spelled there) has played an important role in San Diego .. it is host to the largest naval fleet in the world, and the only major Sub- and Ship-building facilities on the West Coast of the US. In fact, there are more than 35,000 defence personnel and contractors in San Diego – plus about 5% of the general population work in defence-related industries. Driving across the Coronado Bridge gives you a panoramic view of the shipyards that stretch off into the distance toward San Ysidro – the border with Mexico. 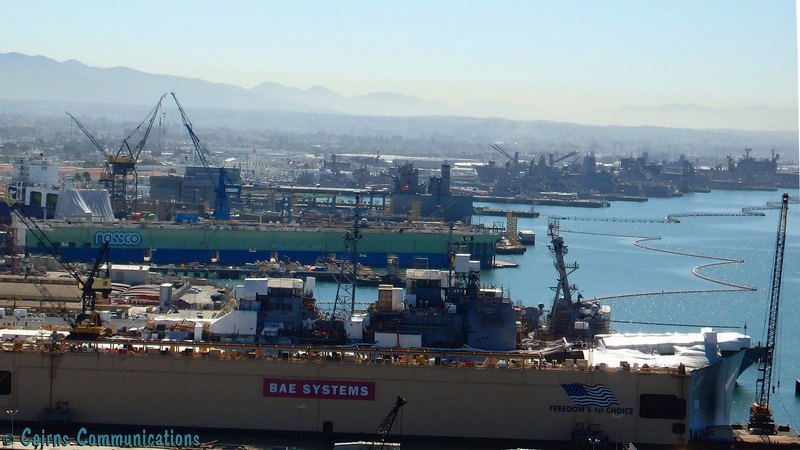 General Atomics, Cubic and NASSCO are all based here – and travelling past their front gates in the San Diego light-rail is an awe-inspiring trip, with millions upon millions of dollars worth of ships being worked on at any one time. There are more than 50 ships stationed there, plus Naval shore facilities, Marine bases, Coast Guard stations, and airfields aplenty. There has been a naval presence in San Diego since the days of sail – but it was in the aftermath of World War One that the US Government decided to buy a series of piers from a failing concrete barge company – and the expansion’s continued almost ever since.